One of the most diverse groups of micro-wasps is the Chalcidoidea, a bewildering array of intricate little jewels. A number of chalcidoid taxa have been extensively studied due to their roles as parasitoids of insect pests, but there are also many groups of chalcidoids that remain little known. One such group is the Chromeurytominae. Male Chromeurytoma sp., copyright John Heraty. The Chromeurytominae are a small group of chalcidoids primarily known from Australia, where they are represented by two genera, fourteen species of Chromeurytoma and the monotypic Asaphoideus niger (Bouček 1988). A single species, Pitayana coccorum, has also been described from Bangladesh (Bouček & Bhuiya 1990). 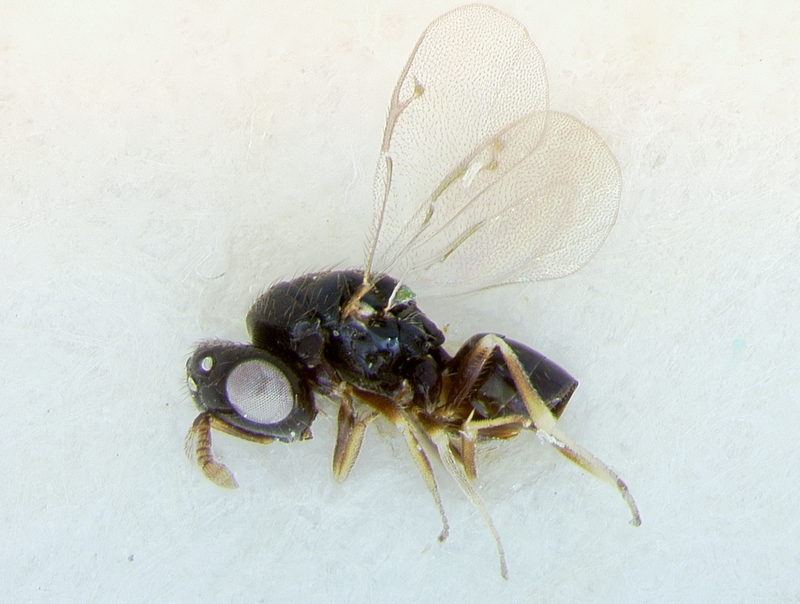 Characteristic features include a relatively large subrectangular pronotum (the first segment of the thorax) and an antenna with six segments between the pedicel and the clava (the club). They are more or less shiny, often with a blue or green metallic gloss, and the gaster is fairly robust and does not collapse in preserved specimens. The affinities of the Chromeurytominae have been rather uncertain and the subfamily was only established by Bouček in 1988. Chromeurytoma itself was originally described in the family Eurytomidae, with which it shares the large pronotum. Other features suggest a relationship with the family Torymidae, such as an occipital carina (a ridge around the back of the head) and prominent cerci. Currently the Chromeurytominae are treated as part of the family Pteromalidae, which is not really saying too much. As our understanding of chalcidoid phylogeny has improved in recent years, it has largely confirmed what many workers had long suspected: that once you account for the other families, the Pteromalidae is pretty much just what's left over. Nevertheless, the broad-scale analysis of chalcidoids by Heraty et al. (2013) places the Chromeurytominae within a cluster of 'pteromalid' subfamilies, closer to the type subfamily Pteromalinae than to either the Eurytomidae or Torymidae. The chromeurytomines are a bit of a mixed bag in terms of host species, but there is the common thread that their hosts are immobile or semi-sedentary plant-feeding insects. Pitayana coccorum attacks mealybugs and other soft scales, with multiple larvae potentially developing on a single host. Asaphoideus niger attacks the citrus leaf-miner Phyllocnistis citrella. The Chromeurytoma species are associated with galls on trees such as Eucalyptus; presumably they are parasites of the insects forming the galls. Bouček, Z., & B. A. Bhuiya. 1990. A new genus and species of Pteromalidae (Hym.) attacking mealybugs and soft scales (Hom., Coccoidea) on guava in Bangladesh. Entomologist's Monthly Magazine 126: 231–235. Heraty, J. M., R. A. Burks, A. Cruaud, G. A. P. Gibson, J. Liljeblad, J. Munro, J.-Y. Rasplus, G. Delvare, P. Janšta, A. Gumovsky, J. Huber, J. B. Woolley, L. Krogmann, S. Heydon, A. Polaszek, S. Schmidt, D. C. Darling, M. W. Gates, J. Mottern, E. Murray, A. D. Molin, S. Triapitsyn, H. Baur, J. D. Pinto, S. van Noort, J. George & M. Yoder. 2013. A phylogenetic analysis of the megadiverse Chalcidoidea (Hymenoptera). Cladistics 29: 466–542. If I understand correctly, Chromeurytoma isn't thought to cause galls itself. Rather, other insects are creating the galls, and the Chromeurytoma are feeding on the insect inside the gall. That said, chalcidoids are commonly overlooked because of their small size and the shortage of experts with the nous to ID them; it would not be impossible for these guys to be more widespread than currently realised. On another note, my partner used to get quite excited when he would see Eucalyptus trees in the background when we were watching something filmed outside Australia. I pointed out to him that these days Eucalyptus are pretty much worldwide.